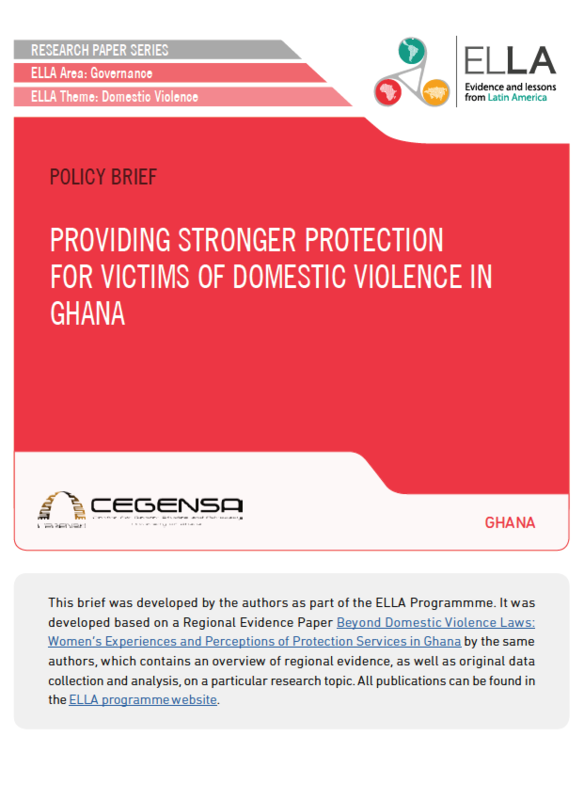 Based on an in-depth study of one of only two shelters for domestic violence survivors in Ghana, this brief identifies policy interventions to improve protection services in the country, and recommends a model for shelters that is more suited to survivors’ needs. Ghana passed the domestic violence act as far back as 2007 but the absence of a legal instrument backing the law has left the provision and coordination of support services, such as shelters for domestic violence survivors, in the hands of mostly non-state actors. Until recently Ghana had only one shelter, owned and run by a non-governmental organisation (NGO) – the Helpers Foundation. The Government has now set up another shelter in Accra but there is little empirical evidence to help us understand the nature of these shelters and the services they provide to domestic violence survivors. The Centre for Gender Studies and Advocacy (CEGENSA) has conducted a study on the Helpers Foundation’s shelter which is indicative of the kinds of policy interventions needed to improve protection services in Ghana. In our study we found that though the shelter faces financial constraints and does not offer a wide variety of services, domestic violence survivors gained security and support that helped them in the recovery process. On the other hand we also discovered that the shelter’s policies undermine clients’ economic independence and family ties and that because the shelter has no clear exit strategy clients have difficulty leaving the shelter to lead more secure and independent lives. In this policy brief we advocate a more comprehensive approach to protective services in Ghana, including the provision of shelters. We share the experiences of both clients and staff at the shelter established by Helpers Foundation and recommend a model of shelters that provides strong protection and support to clients, taking into account the need for them to generate income and have contact with family. We also recommend firm exit plans that support survivors to transition out of shelters as soon as practicable. We acknowledge the financial implications of setting up shelters and suggest that it is better to take an incremental approach to providing shelters for survivors of domestic violence in Ghana than to provide none at all. The establishment of a model of shelters that takes into account the cultural expectations of work and family in needed. Shelters must offer strong protection and support to clients, and at the same time address client’s need for income generation and contact with family. A more rigid exit plan for each client that is time bound in order to reduce dependence of clients on the shelter and bolster their independence. A continuous training on the special needs of domestic violence survivors and the importance of ensuring that they do not experience secondary victimization is needed. It should be targeted at frontline staff and duty bearers likely to come into contact with survivors, especially at health posts, police stations, courts, and shelters. Beyond Domestic Violence Laws: What Else Makes Responses to Domestic Violence Effective? What Makes Domestic Violence Legislation More Effective?